Fear The Reaper. 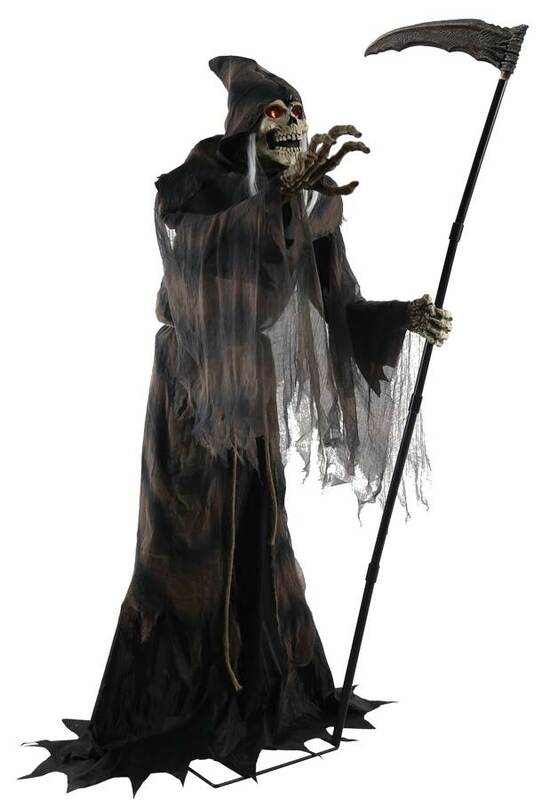 This terrifying 6' character features a soft-PVC death's head skull with yellow LED light-up eyes, easy-to-assemble metal frame, slush-PVC skeletal hands & plastic reaper's Scythe. The Reaper is dressed in a black and gray fabric hooded costume with shredded-gauze details. Once activated, the Lunging Reaper's eyes will light up with an other-worldly glow as he lunges towards you while saying one of four sayings. Plug in the UL power adapter into any standard outlet and choose from Steady-On, Infra-Red Sensor or Step-Here Pad (included) activation to operate. The infra-red sensor works up to 6.5' feet away and works in all lighting conditions. Item includes volume control and easy-to-assemble quick-connect poles.